Two weeks removed from national election, that re-elected President Barack Obama, the 2014 mid-term elections are “on and poppin’.” I wonder if the Democratic Party has sufficiently learned from the debacle of 2010. It is obvious that the Republican’s have not learned any lessons from this last election season, so the test is, will the Democratic Party stand by what they profess and force the Republican Party to stand by their failed logic, and their total disdain for the American people, and the election process, that returned the President to office, and gained seats in both the Senate and the House of Representatives for them? At stake, for the Democrats, at the national level, is a possible re-taking of the House of Representatives and gaining a filibuster-proof Senate. At the local level there are several “red-state” Governorship’s and State Legislatures in play. From what I’ve read, the assault on women’s reproductive choices, by Republicans, has resumed with refreshed attempts around the country to try to circumvent Roe v. Wade, using the states as their primary vehicle. The war on the uninsured and the poor is advancing with Republican Governor’s rejecting certain provisions of the Affordable Care Act (ACA). Provisions such as the “insurance exchanges” for entrepreneurs and small businesses with less than 50 employees, and refusing to expand Medicaid services for individuals and families living at or near poverty levels, and the poor. As for the battle over reproductive choices, that’s a battle Democrat’s and Progressives should welcome. A true conservative court will stand by the rights of the individual against the state. A Republican court will not. Chief Justice Roberts has shown, with his decision on the ACA, that he does not want his court to be branded as the “Republican Court.” Notwithstanding some of the other Justices, it is my belief that the right’s of the individual will prevail. We’ve seen that already with laws like “stand your ground,” and “open carry” laws, for guns. We just have to be prepared, and willing to fight for what’s right. Now, about the ACA. Caught inside the Republican bubble, they believed that the President would not be re-elected, they believed that the ACA would not stand constitutional muster, they believed that their party would win the Senate and increase their majority in the House. After the ACA was upheld by the SCOTUS, they believed that, when elected, a Romney/Ryan administration would repeal it, or at the least not fund or enforce it. With this as their thinking, many of them simply did not prepare to commit to the exchanges by the deadline. They also knew that the Federal government would step in and create the exchanges if they fail to do so. As you know, the Medicaid expansion provision will mean approximately 17 millions people will receive coverage they otherwise would not have, and will mean the hiring or re-hiring of thousands of people nationwide, to handle the increased case loads. The Republican Governors, as one of their excuses, claim they cannot afford to implement the exchanges or the expansion, though the Act will pay 100% of the cost for 2 years and 90% of the cost of the expansion for many years after that. Another excuse is that they don’t want the Federal Government interfering in their state policies. Their reticence means that millions will not be covered and thousands of jobs will not be made available, simply, because of their politics. That being said, [this] becomes a prime opportunity for Democratic candidates as they begin their campaigns. Many of November’s winning Democratic Party candidates ran on these very issues. I wouldn’t wait another minute in these “Red States,” to force the Republican politicians, from the state legislatures to the Congress, to declare where they stand, on the record, about these issues, and challenge them publicly, about their stance. These red states are among the most in need of the ACA and their Governor’s, State Houses, and Congressmen and women, should be forced to explain to their constituents why Obamacare is not being made available to them. At the same time, the “Blue State Governments” should boldly tout the advantages of the Act to their constituents. Their “red state” neighbors, seeing the benefits of the Act will challenge their leadership to comply, or opportunities will be created for Democrats to take over these State Houses and Legislatures, and to represent them in the Congress. These are just a couple of the issues that will define this election. There’s also Planned Parenthood, personhood, voter ID, state election laws, and much more. HEY MITT, YOU DIDN’T BUILD THIS DEFEAT BY YOURSELF! I’m going to resist the temptation to gloat. Well, maybe just a little bit ( NAH-NA-NA-NAH-NAH). Okay, now I’ve got that out of my system. Seriously though, I and a whole lot of American’s had real problems with you, from tax returns to policy shifts. But, it seems that you had a whole lot help in bringing about this defeat. Let’s start with you first. Your refusal to reveal your tax documents was a problem, but not your most significant one. The truth is [that] if you had revealed them it may have helped you. It’s possible that had you done so it would have given the voters a look at just who the real Mitt Romney is. America doesn’t have a problem with wealthy people. We’ve had many leaders that have come from privilege. Given the cost of getting elected today if you don’t have significant resources, or access to them, it is difficult to run for any office at any level. That’s not your problem, that’s a problem for America. But without the anchor of an identity, you seemed to most of us to be like a ship without a rudder, cast upon the sea of our democracy, with no discernible direction, no way for us, the voters, to know just where you would lead us. So with no real understanding of the captain of the “great ship republican” at sea, we only had the republican ship to see. What we saw, well, was downright scary. Just take a look, from our perspective, and you can see what we saw. We saw Todd Akin and Richard Murdock. We saw Scott Walker and, your own choice for VP, Paul Ryan. We saw John Kachich and John Husted. We saw Rick Scott and Rick Detzner. We saw Jeff Flake in Arizona telling people to go to the wrong polling place. We heard John Sununu and Donald Trump. We heard Rush Limbaugh and Glenn Beck, Ann Coulter and Laura Ingraham, Bill O’Reilly and Sean Hannity. We heard Newt Gringrich and Grover Norquist. We read the Washington Times and The National Review. We saw the attacks on President Obama, the our of context quotes, the distortions, the outright lies. We saw the assault on women’s rights to reproductive choices and access to healthcare. We saw the disdain your party had for Latinos, the contempt for the LGBT community. 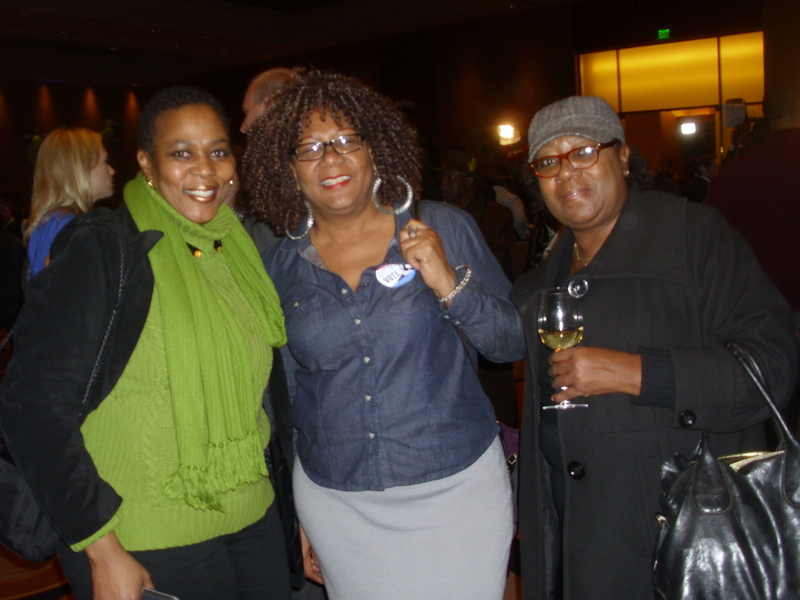 We saw how the African-American community was discounted. We watched your party’s attempts to suppress the vote. We watched them attempt to game the system. We even saw overt, blatant attempts to cheat. The margin for the President was about 3 million votes, but we will never know how many voters were affected by your party’s efforts, how those efforts affected down ballot races and initiatives. Now I know you will say that they are not you, but since you chose not to reveal who you were, and you chose not to rebuke them, we were left to conclude that they “are” you, or at least that you believe and feel as they do. Even your opponents agreed that you are a good man. A family man with strong values and principles. But we never got to see that part of you. By not taking a stand you became a part of a stance that America rejected. So you see, it was a collective effort. What just occurred was not a rejection of just you, but a rejection of what your party has become. If only you had been you, someone with a recognizable identity, someone we could relate to and understand, then perhaps…. You know the last republican president was also a good man. A man of values and principles. But ideology led him, and the people around him, to take America to a place where the needs of the few outweighed the needs of the many. We’ve been there and we’ve decided that’s not where we want to be. So it wasn’t just your many you’s, that lost last Tuesday, it was your party and the way it operates. There’s plenty of blame to go around and plenty of people to share the blame. You did not build this by yourself. Candidate Barack Obama made history in November 2008. That’s true. But what President Barack Obama has done in November 2012 is truly historic. When all is considered, when the story is told, not through the simplistic lens of who won and who lost, America will shudder at revelations revealed by this electoral process, but in the end stand tall in revelry at her ability to stand up against the powerful whose will is, not to live up to the founder’s intent to “form a more perfect union,” but to create a union that “perfectly” suits their purposes. The Republicans, over the last four years, have used virtually every underhanded tactic imaginable. They’ve lied, they’ve deceived, they’ve cheated, they’ve attempted to make a mockery of the very process that makes this the greatest country in the world. They vowed to obstruct the President, and turned around and attempted to blame him for the slow recovery of our economy. They’ve challenged his birth origin, his citizenship, his legitimacy as President. They’ve challenged his love of America. They’ve call him a liar, a Muslim, they’ve refused to acknowledge any of his accomplishments. Indeed many Republicans, including Romney, have tried to co-op the things he has been able to get done, while at the same time, retreating from their own policies simply because the President embraced them and tried to implement them. They accused President of “palling around with terrorist,” said that “he has apologized for America around the world,” castigated him for attending a church with a radical preacher (is he Muslim or Baptist?) They’ve attacked his wife, and family. They even went after his dog. They didn’t stop with the kitchen sink, they threw the whole damn kitchen at him and he didn’t flinch. He didn’t back down. The amazing thing about this race, is that it was so close. How, in the face of all the lies, in the face of all the stupid challenges, in the face of all the obstructive tactics by the Republicans, with their attacks on minorities, with their assault on women’s rights, their shifting positions on issues, with their disdain for the LGBT community, their overt attempts to suppress the vote, could anyone have voted for Romney or any of the republicans running for office. It’s amazing to me. 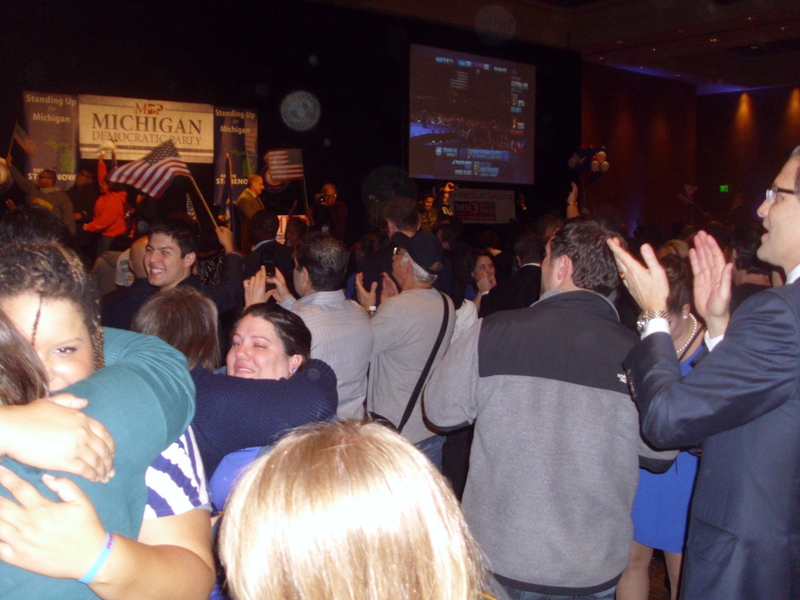 I was at the Michigan Democratic Headquarters, in the Grand Ballroom at the MGM Grand Hotel, on election night, and there was, remarkable as it may seem, an air of confidence in the room as I arrived, about 8:30. 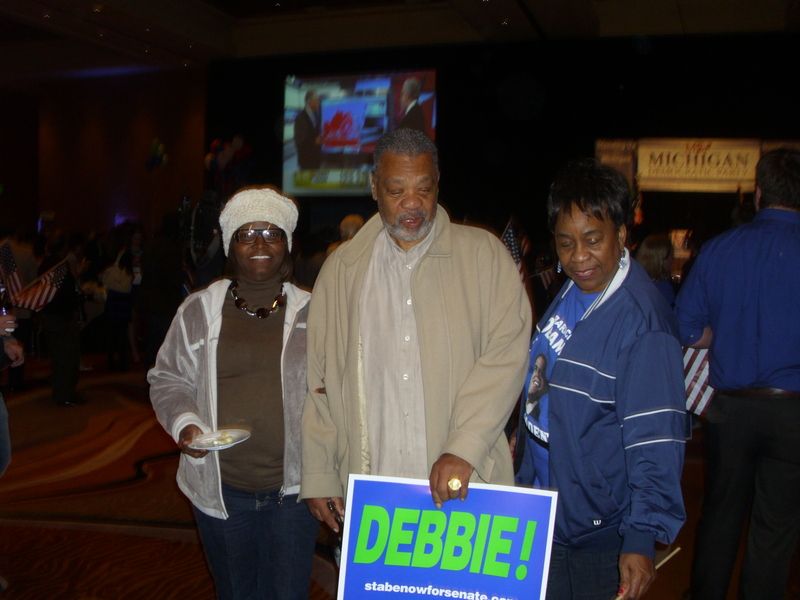 Everyone that I spoke with was upbeat, even as the early returns showed the electoral count favoring candidate Romney. When the polls in the east began to close, the early projections showed the challenger with a 33 to 3 lead, with Romney winning the early vote in the south plus Indiana and the President winning Vermont. Still I didn’t sense any panic among his supporters. There was an energy in the calm, though. 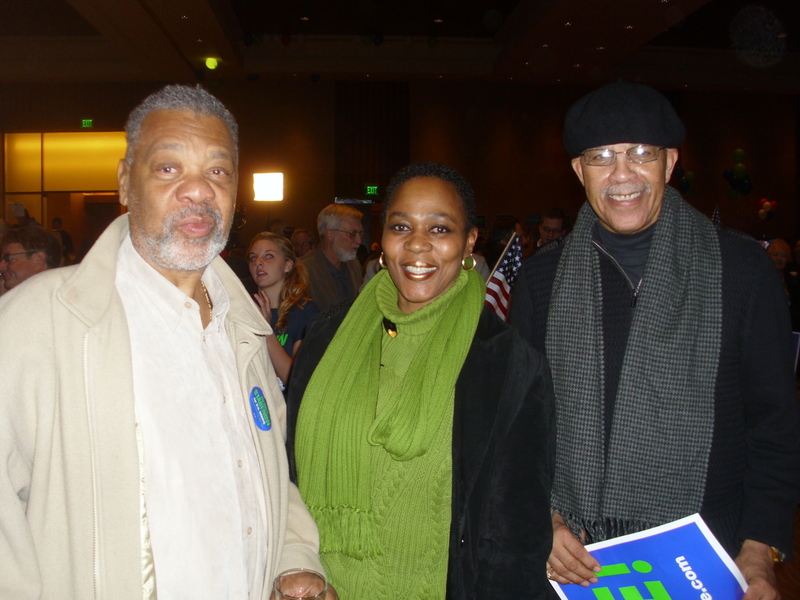 There was much on the table with the US Congress elections and several other important down ballot contests and initiatives, that had the attention of the attendee’s. By 9:00, with more polls beginning to close, more projections had been made. The President had been projected to win all of New England (except New Hampshire, which soon came on board), Michigan, Illinois, Maryland, Delaware, and the District of Columbia. But with Romney winning Arkansas and Tennessee, CBS News projected that Romney was leading the President in electoral votes 88 to 78. With each state projection there were cheers or boos depending on who won or lost, but there was no panic, just an expectation that everything was going to be just fine. 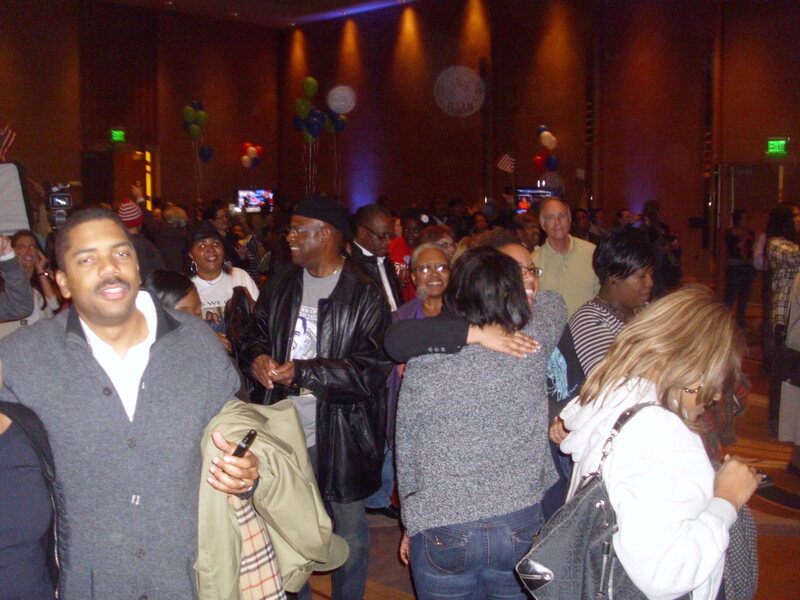 An hour and a half into the evening you could feel the excitement building inside the room. 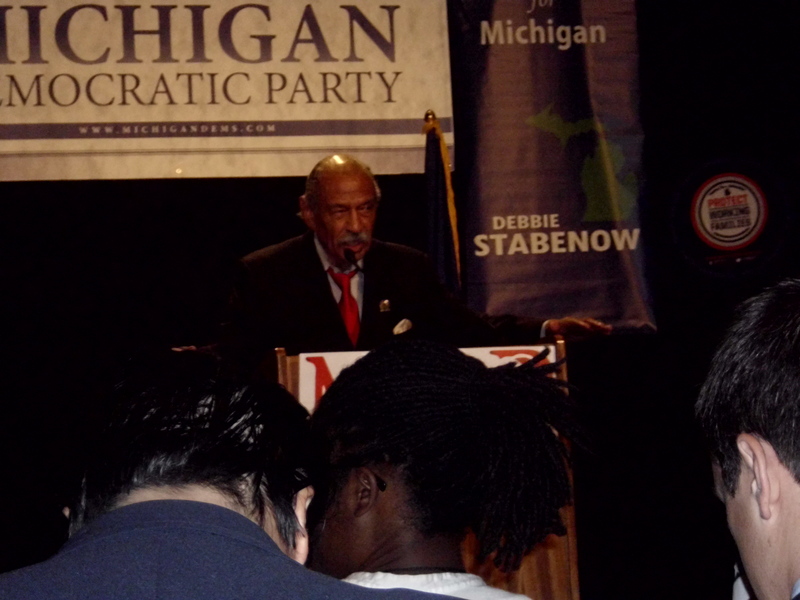 A little past 9:30 newly re-elected Congressman John Conyers approached the podium to address the crowd and a raucous cheer erupted in the room. Conyers, who had faced a primary challenge after being the victim of redistricting by a republican state legislature that moved him from the 14th district to the newly aligned 13th district handily, defeated Republican challenger Harry Sawacki. (This is another example (alignment of voting districts), a perfect example, of why elections matter. Even down ballot. 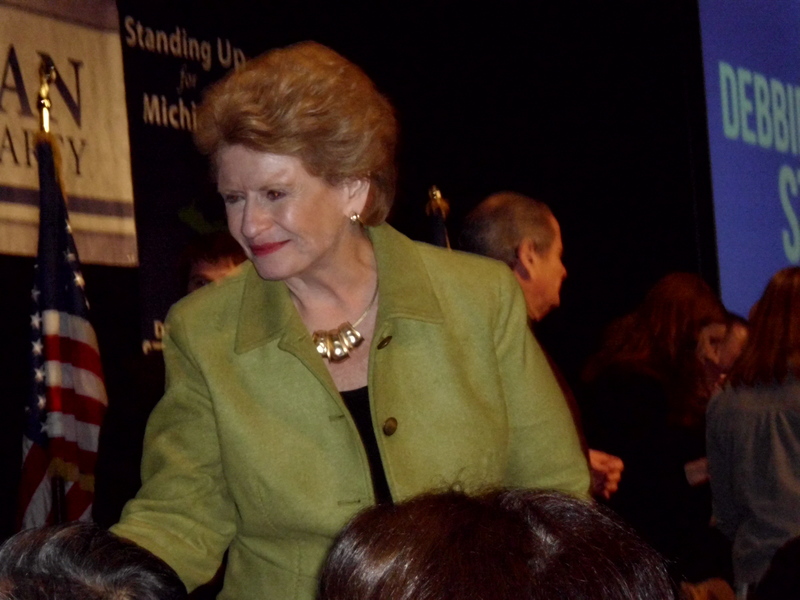 After a few words the congressman introduced newly re-elected Senator Debbie Stabenow to the crowd. The crowd went berserk as the Senator took to the podium. The Senator, armed with the endorsement of the republican-leaning Michigan Farm bureau, easily defeated republican Pete Hoekstra to return to Washington for a third term. Hoekstra, if you’ll remember was widely criticized for running a controversial ad that featured an Asian woman talking in broken english about China taking our American jobs. An ad that even some republicans rebuked as racially tinged and insensitive. 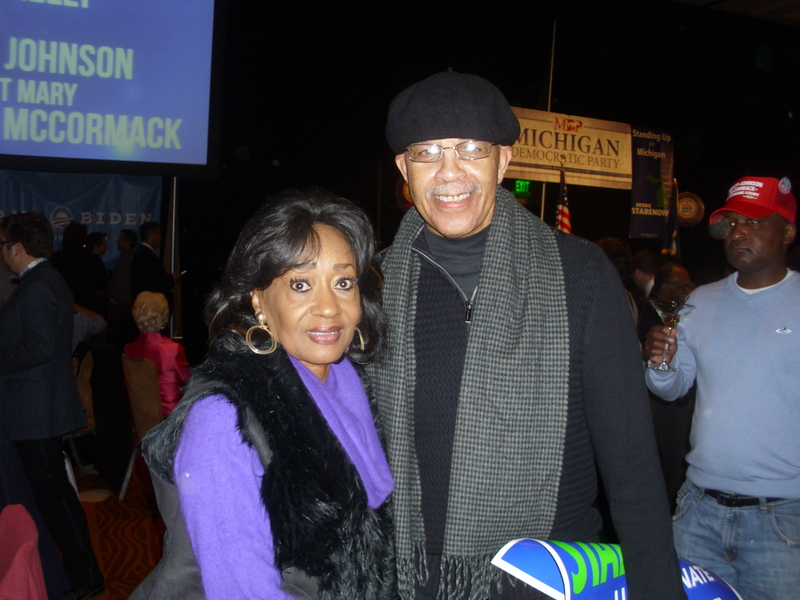 He attempted to brand Sen. Stabenow as the “follower-in-chief” because of her relationship with President Obama, and ran numerous negative ads on TV and the internet as he tried to bring her down, but the Senator stayed strong and positive. 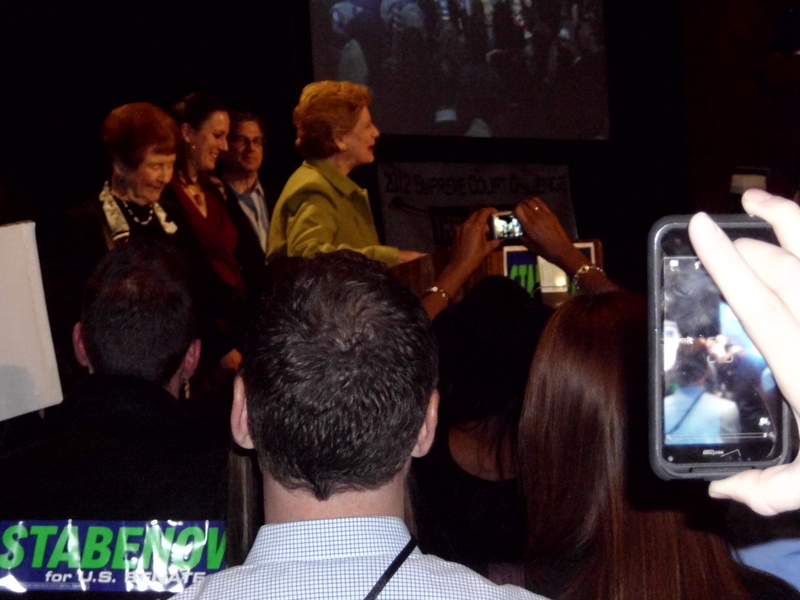 “I am proud that we stuck with our positive message about what we’ve gotten done for Michigan,” said Stabenow. As we approached 10:00 we had more projections. Pennsylvania for Obama. Moments later New Hampshire, Wisconsin (so much for the VP home-state bump), and Minnesota. The vote was so close at this point that CNN was projecting Romney ahead by 152 -143, NBC projected Obama ahead 158-153, and Fox News Channel had it as a tie 153 electoral votes a piece. 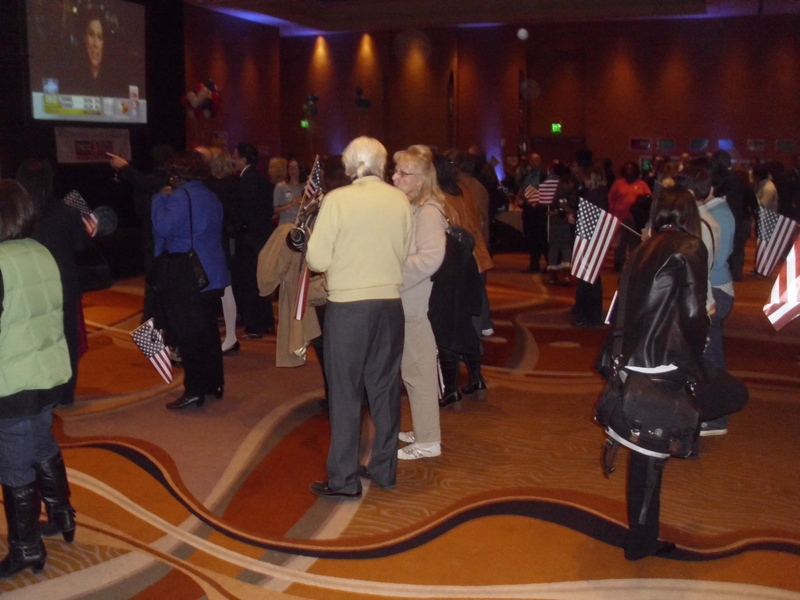 Between 10 and 11:00 Romney picked up Missouri, North Carolina, Nebraska, Utah and Montana and there was a slight nervousness in the crowd, but that all went away at 11:00 when the west coast polls closed. 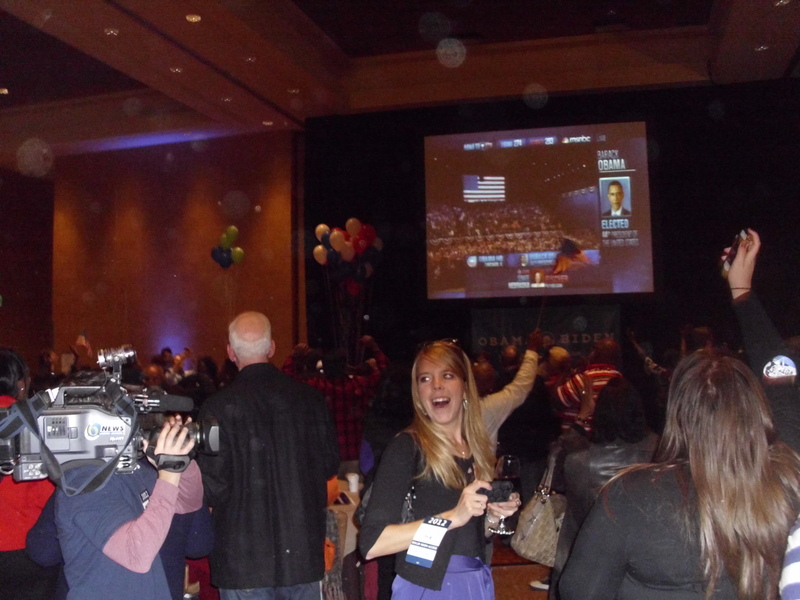 Pandemonium broke out in the ballroom when it was announced that California, Washington State, Hawaii, followed by New Mexico and Iowa were going to The President. The exuberance began to ebb, somewhat, as we became aware that Ohio was pending. 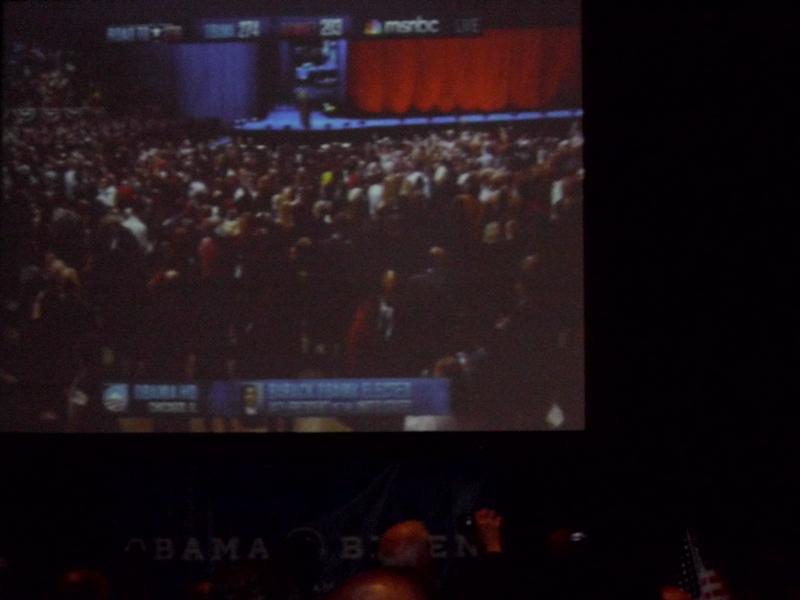 At 11:13 NBC announced that President Obama was going to win Ohio and moments later announced Barack Obama would be re-elected President of the United States. As you can imagine the excitement, the energy, the anticipation all came together and the ballroom could not contain it all. It spilled out of the room, down the hallways, throughout the hotel. It was Christmas and New Years eve all wrapped up in one. I don’t know about you guys, but I was ready for a cigarette. What a night! I wasn’t surprised by the outcome (I had predicted that President Obama would win with 331 electoral votes. He finished with 332). As much as I believed in the President, I also believed in the American People. Yes, the republican party did everything possible to steal this election. Yes, their candidate flip-flopped all over the place and outright lied about himself and the President. But America saw through it all and did the right thing. I wrote in a previous post a thank you to the voters, and I really mean it. There is much yet do and I believe our President is going to get it done, from completing his healthcare initiative to Wall Street reform. We are going to have tax and immigration reform. Hopefully we’ll get campaign finance reform, a change in the way we conduct national elections and a change in the filibuster. President Obama, not burdened by re-election, can use his executive powers to enact programs if the congress does not. America is moving forward and the Republicans can’t stop us. It’s time to get to work. First though, I’m gonna have that smoke. 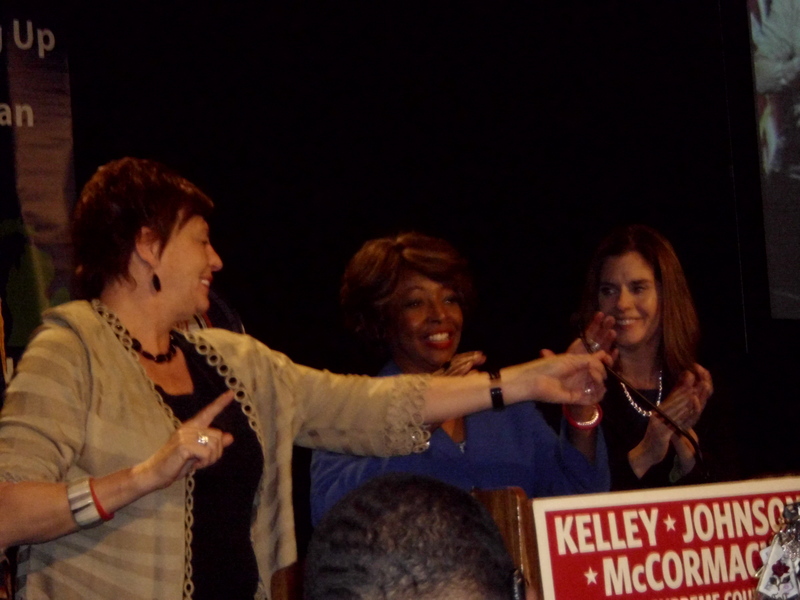 Supreme Court Candidates, (left to right)Connie Kelley, Sheila Johnson and Bridget McCormack. McCormack was the only winner. Looking forward to Wednesday’s debate between President Obama and candidate Romney, I began to wonder, can the President lose or can the candidate win? The only way, I believe that the President can lose is if he takes the bait, and get’s drawn into a lot of tangential hypothetical’s. You know, the could’ve, would’ve, or should’ve(s). The common wisdom on the right is that President Obama can not run on his record. What they are counting on is that the vilification of his accomplishments and his efforts to improve life in these United States has worked, or is working. I don’t believe that it has, or will. As more and more of his policies roll out, policies that were, in many cases delayed or watered down by a congress committed to bring him down, the American people are seeing the benefits of Obama’s presidency. With the Affordable Care Act, Financial Reform, Workplace Equality, the ending of the War in Iraq, the killing of Osama bin-Ladin, the decimation of Al-Qaeda, the fall of Khaddafi, and [of] Mubarak, the drawing down of the War in Afghanistan, the Auto Bailout, and perhaps the most important, The American Recovery Act, without which the country, as we know it, would not have survived, there is much the American people and the President can point to with pride. When all of this is considered, along with the fact that the Republican leadership, including House Speaker John Boehner, House Majority Leader Eric Cantor, Senate Minority Leader McConnell, and the entire Tea Party caucus, have walked lock-step in their attempt to defeat his efforts even at the expense of America’s recovery, these accomplishments seem all the more remarkable. This is, though, where the potential problems may arise. The president does not need to oversell his accomplishments, though there may be some temptation to do so. The risk is to become the “I” candidate. The president has been careful, over his time in office, to encourage the American people to become more involved, more vocal, and it has worked. Much of what he has been able to do has come as a consequence of an energetic, involved, citizenry. If he is baited into defending or overselling what he has done, he risks turning off the support his accomplishments have garnered. The other trap, would be to be baited into ascribing motive’s to the constant stream of misrepresentations, distortions, and outright lies coming from his opponents on the right. To play the victim. He should let “them” explain their motives. The American people see them for what they are (lies). They also know who is telling them. These are not just lies “about” him, they are lies “to” the American people. I believe we (the people) are smart enough to realize that. Now, I know I haven’t mentioned how it may be possible for candidate Romney to win. Well that’s the truth. I mean, “the truth” is the reason that Romney can’t win. If he tells the truth, the American people see him for who he really is. If he doesn’t, well, the American people will see him for who he really is. Either way he can’t win. This first debate will, rightfully, include discussions about the candidate’s campaign, the republican convention, his ill-timed misstatements about the events in Libya, and definitely about his 47% comments. I can’t wait to hear his responses.